Great view of a very large meteor 4:30 AM Pacific near Whitehorse Yukon. Jim McIlvaney Thank you Jim! Date and Time of event? Location name (town,city) where you were when saw the meteor? 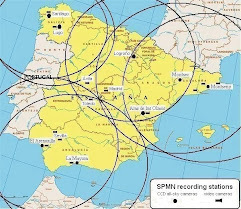 Start and Stop location in sky? Direction of movement? Duration of Event (seconds)? Brightness ( in comparison with Venus, Moon, Sun) color, sounds? Photos? Videos? please email LunarMeteoriteHunter@gmail.com Your reports make it possible for all to check what they saw as well. Thank you! 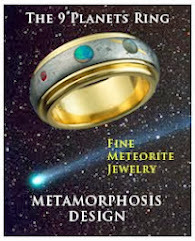 2011 The Year of Meteors! Saw what appeared to be an extremely bright green meteor traveling almost straight down. It has a very long and wide green tail with what appeared to be many pieces breaking off behind it and turning white. It was visible for approximately 5 seconds. I’m almost always out running that time of day and so I see tons of meteors, but this is the first time one was so bright and unusual that it actually startled me. Thanks, Liam Douglass, Bastrop, TX Thank you Liam! Saw the same bright green meteor in North Central Texas (Fort Worth) at about 03:30 this morning (Aug 31, 2011). The bright flash illuminated the clouds and I at first thought it to be lightning until I caught a brief glimpse of the fireball (between clouds) heading almost straight down. I was looking to the northeast at the time of the sighting. Cheers, Larry McNeely, Fort Worth, TX Thank you Larry! Eddy, Texas. At around 3:45AM I saw the bright green fireball traveling from the 10:00 position south to the north burning out around the the 2:00 position. So bright, it was like morning daylight for about 5 seconds. -John Light Thank you John! I was on my was to deliver newspapers to Marietta, Texas around 3:30am when I saw the night light up bright as day in the northern sky. This lasted only a second. 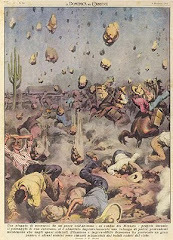 That evening I told my mother-in-law what I had witnessed and she said that there had been reports of a meteor on the morning newscast. I didn't see the meteor, but I will never forget the sky changing from night to a blue sky and back again in less than a second. Mike Newton; Simms, Texas Thank you Mike! Was that a shooting star? Columbia, South Carolina arrived from google.com on "Latest Worldwide Meteor/Meteorite News: 美国 隕石 Breaking News--- Major SE USA Meteor Seen SEVEN States 29APR2011" by searching for sonic boom in chapin SC. Several persons from North and South Carolina, Georgia and Kentucky searching this site but no confirmation.... PLEASE send in your sighting reports! Thank you!
" Researchers at Cal­tech and sev­eral author insti­tu­tions have named a newly dis­cov­ered min­eral in a mete­orite, “brear­leyite,” in recog­ni­tion of Uni­ver­sity of New Mex­ico Pro­fes­sor and Chair of Earth and Plan­e­tary Sci­ences Adrian Brear­ley for his con­tri­bu­tions to mete­orite mineralogy. Brear­leyite is an extremely rare, fine-grained min­eral that is a new mete­oritic Ca-Al (calcium-aluminum) and Cl-rich phase. The sam­ple was dis­cov­ered in a car­bona­ceous chon­drite mete­orite found in North­west Africa in 2003. It likely formed from a reac­tion of krotite with hot Cl-bearing gases or flu­ids on a small aster­oid, 4.56 bil­lion years ago. Krotite is another recently dis­cov­ered min­eral that is named after Dr. Alexan­dre Krot, a col­league and col­lab­o­ra­tor of Brearley’s at the Uni­ver­sity of Hawai’i, Manoa. The min­eral and its name, “brear­leyite,” have been approved by the Com­mis­sion on New Min­er­als, Nomen­cla­ture and Clas­si­fi­ca­tion (CNMNC) of the Inter­na­tional Min­er­alog­i­cal Asso­ci­a­tion. Three round, thin sec­tions of one inch diam­e­ter con­tain the material. " California's second witnessed meteorite fall, Red Canyon Lake now official! 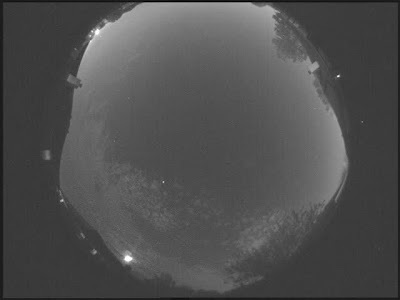 The American Meteor Society has received several reports of a rare daylight fireball over the state of Minnesota, plus southern Manitoba, and western Ontario. This event occurred near 5:15pm CDT Saturday afternoon August 27th. Of the half dozen reports received so far, white is the most mentioned color. The average brightness reported by witnesses was between the light produced by a full moon and that of the sun. Refer to event #920 for 2011. This reference number is subject to a slight change. 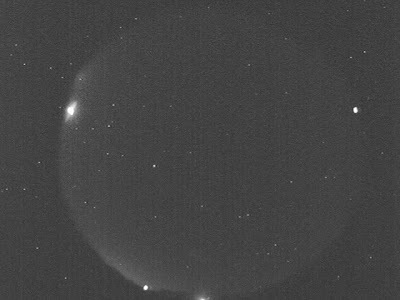 The American Meteor Society has received numerous reports of a very bright fireball over the states of Washington and Oregon, occurring near 11:10pm PDT Friday evening August 26th. Of the two dozen reports received so far, yellow was the most mentioned color. The average brightness reported by witnesses was near the light produce by a half moon. refer to event #917 for 2011. This reference number is subject to a slight change. Did meteor land here? » Local News » The Herald, Sharon, Pa.
During this period the moon reaches its new phase on Monday August 29th. At this time the moon will lie near the sun and will not be visible at night. Next week the waxing crescent moon will enter the evening skies but will set soon after dusk, allowing meteor observers to view under dark conditions during the late night and early morning hours. The estimated total hourly rates for evening observers this week is near six as seen from the northern hemisphere and three as seen from the southern hemisphere. For morning observers the estimated total hourly rates should be near fifteen as seen from mid-northern latitudes and seven from mid-southern latitudes. The actual rates will also depend on factors such as personal light and motion perception, local weather conditions, alertness and experience in watching meteor activity. The radiant (the area of the sky where meteors appear to shoot from) positions and rates listed below are exact for Saturday night/Sunday morning August 27/28. These positions do not change greatly day to day so the listed coordinates may be used during this entire period. Most star atlases (available at science stores and planetariums) will provide maps with grid lines of the celestial coordinates so that you may find out exactly where these positions are located in the sky. A planisphere or computer planetarium program is also useful in showing the sky at any time of night on any date of the year. Activity from each radiant is best seen when it is positioned highest in the sky, either due north or south along the meridian, depending on your latitude. It must be remembered that meteor activity is rarely seen at the radiant position. Rather they shoot outwards from the radiant so it is best to center your field of view so that the radiant lies at the edge and not the center. Viewing there will allow you to easily trace the path of each meteor back to the radiant (if it is a shower member) or in another direction if it is a sporadic. Meteor activity is not seen from radiants that are located below the horizon. The positions below are listed in a west to east manner in order of right ascension (celestial longitude). The positions listed first are located further west therefore are accessible earlier in the night while those listed further down the list rise later in the night. The last of the August Draconids (AUD) will occur this weekend from a radiant located at 18:39 (280) +63. This position lies in southeastern Draco, five degrees southwest of the fourth magnitude star Delta Draconis. Maximum activity occurred on August 21st so rates would be low, less than one per hour at best. With an entry velocity of 23 km/sec. most of these meteors will appear to move slowly. The radiant is best placed near 2200 Local Daylight Time (10pm LDT) when it lies highest in the sky. Due to its high northern declination this shower is not well seen from the southern hemisphere. The wide Antihelion (ANT) radiant is now centered at 23:08 (347) -04. This area of the sky lies on the Pisces/Aquarius border, twenty degrees south of the second magnitude star Markab (Alpha Pegasi). This radiant is best placed near 0200 LDT, when it lies on the meridian and is located highest in the sky. Due to the large size of this radiant, any meteor radiating from Aquarius, western Pisces, western Cetus, or southern Pegasus could be a candidate for this shower. Rates at this time should be near one per hour as seen from the northern hemisphere and two per hour as seen from south of the equator. With an entry velocity of 30 km/sec., the average Antihelion meteor would be of medium-slow speed. The Aurigids (AUR) are first seen on August 28 and peak on Thursday morning September 1st. On that morning of maximum activity, the radiant will be located at 06:02 (091) +39. This position lies in central Auriga, two degrees north of the third magnitude Theta Aurigae. The radiant is best placed during the last hour before the start of morning twilight when it lies highest in a dark sky. Hourly rates this weekend will be very low, less than one per hour no matter your location. At maximum, hourly rates during the last hour before dawn will range from 2-5 as seen from the northern hemisphere. South of the equator, this shower is not well seen as it lies low in the northern sky during the morning hours. With an entry velocity of 67 km/sec., most activity from this radiant would be swift. As seen from the mid-northern hemisphere (45N) one would expect to see approximately fourteen sporadic meteors per hour during the last hour before dawn as seen from rural observing sites. Evening rates would be near five per hour. As seen from the mid-southern hemisphere (45S), morning rates would be near five per hour as seen from rural observing sites and two per hour during the evening hours. Locations between these two extremes would see activity between the listed figures. Assiniboia, Saskatchewan arrived from google.ca on "Latest Worldwide Meteor/Meteorite News: MBIQ Indicates Possible Meteor Events Over Arkansas, Hawaii, Alberta, Saskatchewan, Ontario 28AUG2011" by searching for aug 28 2011 meteorite over saskatchewan. Benton, Arkansas arrived from google.com on "Latest Worldwide Meteor/Meteorite News" by searching for fireball over arkansas 8-28-2011. Fort Mcmurray, Alberta arrived from google.com on "Latest Worldwide Meteor/Meteorite News" by searching for fireball in canada last night. United States arrived from google.com on "Latest Worldwide Meteor/Meteorite News" by searching for meteorites 2011 aug 28 hawaii. London, Ontario arrived from google.ca on "Latest Worldwide Meteor/Meteorite News" by searching for ball of fire in sky london ontario Aug 28 . Assiniboia, Saskatchewan arrived from google.ca on "Latest Worldwide Meteor/Meteorite News" by searching for aug 28 2011 830pm over saskatchewan fire comet. Timmins, Ontario Meteor aug 27th 2011 9:45/9:50 pm eastern A few of us were outside in our front yard at about 9:50 pm eastern, and from the northeast over our heads was a big ball of light that looked like it was on fire. Someone described it like a hot air balloon pulling its string. The ball flew over our houses and slowly got smaller and smaller until it just disappeared (within 3 minutes). The Ball was totally orange. Then about 10 minutes later we saw this very bright “star” which was the size of three stars combined zoom in the sky(about 1’-2 minutes). It just appeared and disappeared. After that there were 3 more bright lights that zoomed by (1 minutes from when it starts to when it disappears). We were in our front yard on Martin Ave. It was coming from the North east. Then we saw these two girls walking down the street and when we asked them if they saw anything they just heard a large bang and saw the other white lights sway by. -Amber Thank you Amber for your kind report! standing in street facing northeast sky - two of us saw a VERY large meteor, (largest i have ever seen), cross from the east heading north. it had a very long tail - the whole thing was bluish white. it lasted 3-5 seconds max. it was ten times the brightness and size of venus. i am surprised there are no other sightings on here!! it was magnificent. thank you, -m. dillon Thank you M. Dillon! Kent, Ohio arrived from google.com on "Latest Worldwide Meteor/Meteorite News" by searching for meteor august 27, 2011. Esko, Minnesota arrived from google.com on "Latest Worldwide Meteor/Meteorite News" by searching for august 27, 2011 5:25pm duluth mn news burning flash in sky. Winnipeg, Manitoba arrived from google.ca on "Latest Worldwide Meteor/Meteorite News" by searching for meteor manitoba august 27. Grimsby, Ontario arrived from google.ca on "Latest Worldwide Meteor/Meteorite News" by searching for orange light over Grimsby, ON, Saturday Aug 27, 2011. We need your reports; thank you!